Philippe Dubois once said that a painter can always decide himself when his picture is completed whereas for a photographer his work is done with the release of the shutter. This is surely not true when it comes to Brigitte Konyen´s artwork, where the photographic images merely serve as a starting point. For her series "Abstracts" she starts with strips of photographs showing landscapes or structures found in nature, sometimes intertwining them with strips of structural acrylic painting – an interplay of painting and photography. In these photo-weavings, the smooth surface of the photographic picture breaks open with the woven structure, the varying width of the strips creates an undulating surface instead of giving the illusion of space. The explicitly constructed nature of the photographic memory-image seems completely exposed. Thus the familiar and unfamiliar combine to form a new phenomenon that clearly awakens essential questions concerning our social conventions of perception. In her series that concentrate on the complexity of remembering, Brigitte Konyen uses a wider form of narration. Here numerous photographs are woven together, proportion as well as color scheme are calculated in advance. The created image turns out to be a construction of both the composed image and the memory. The image always consists of two layers, a horizontal and a vertical, but at the same time the viewer´s searching gaze can discover numerous new perspectives depending on the focus: the abstract large-format overview of the piece or the countless little fragments that make up the second layer. The material, the photographic paper, literally plays the leading role. It is due to the material that these new images can be composed, enabling the viewer to constantly switch focus between the material and newly created images. Every little change in distance or angle of view opens up new possibilities of perception. 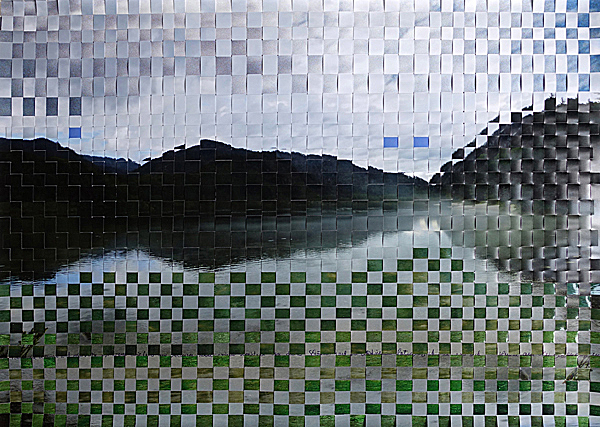 The large-format picture, the overview, visible from a distance, dissolves in fragments when approached – or reverses when backing away. Brigitte Konyen undermines our expectations of the photographic image by actually reconstructing originally perspectively centered images into anarchistic two-dimensional raster images. The pictorial space becomes a concrete surface, where woven crossings define new central points. These works seem to tell a story, but not a specific one. It is a story that to the viewer opens up as both subjective and associative. By creating a subjective story of memories, the aritist creates a subjective story of memories for all of us. Brigitte Konyen is an Austrian artist living in Vienna. Her artistic practice comprises mostly of photographic images while integrating painting and drawing into her work. One key theme of the artist is the deconstruction and reconstruction of her photographs. For this she uses one of the oldest handcrafts in the world - weaving or plaiting.